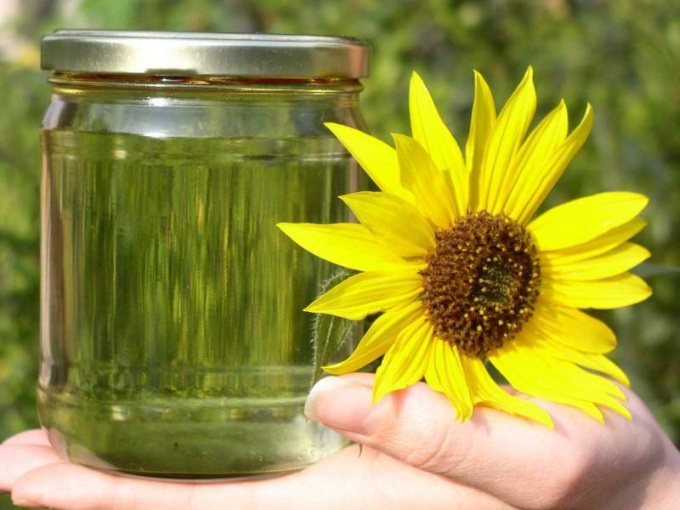 Like any other sunflower oil is obtained either by pressing or extraction. Both conditions require additional cleaning. Of course, clean oil production, but if you prefer to press it yourself, and clean will have. Strain the oil using a special filter (it is a funnel of dense non-woven cloth or paper) or fabric. This way you can remove the excess cake, seeds and other impurities. Do not use either during production of the oil, during filtration metal containers; give preference to inert materials such as stainless steel, mild steel and aluminium with epoxy coating, glass, food grade plastic. Cedite oil immediately, because the impurities contribute to the rapid deterioration of the product. Please note that many Housewives instead of filtering using a technique of defending the oil. Close the tank with oil tight lid and leave for a day. During this time, the oil may stratify, light particles will rise to the surface, and at the bottom appears muddy sediment. Remove all the peel and carefully pour product into a clean container. You got unrefined oil. Keep this oil only in the dark. Do not place in the refrigerator and never cook on it, as formed at high temperature toxic compounds. However, strain the oil enough; it is important to understand that in obtaining oil from seeds pressed into it, in addition to the main group triglitseridov pass structural lipids, which determine the characteristic color, smell and taste, as well as water, paraffins, waxes, polycyclic aromatic hydrocarbons, residues of herbicides and pesticides. It is important to clean the oil from these components. For deep cleaning use methods of deodorizing and refining of oils. Both these processes are difficult for home reproduction and require significant knowledge of chemistry substances. Ropinirole oil with alkali. Deodorize, dry steam treating at a temperature of 170-230 ° C in vacuum conditions. To do this, use a custom installation, in the VAT where you pour the oil and the tank has the desired amount of water. Deodorized oil is completely ready in 3-5 hours. Keep vegetable oil at a temperature not above 18 degrees; refined - 4 months, whether oil - 2 month.